Quote collation and allocation to suitable groups, then re-aligned with themes and further matched to PBH (Problems and Benefits Hierarchy). Ad hoc allocation of comments was done, from topics most often mentioned. The actual discussions are available online to all members of these social network groups. This work is referred to as Research Group 2. 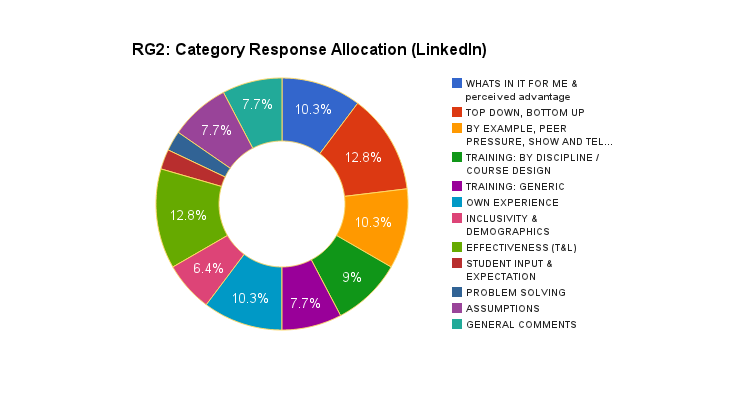 Response categories were devised mainly using the LinkedIn responses as reference, as there was sufficient data to carry out this required task. These were then aligned with Literature themes. NB A PDF of all responses can be made available on request, however is not available publicly as the HE LinkedIn group is a member only group. Around 40 comments were made in a discussion instigated by this research, in the Teaching and Learning in Higher Education LinkedIn member only (private) group. All participants appear to be academic or PSD staff in higher education. Many appeared to be directly involved with TEL, either as practitioner lecturers, or support staff. Q1 What makes the most impact on encouraging staff to use technology in their learning and teaching? I’d love to hear what people think. There is noticeable similarity with this table and the table of themes in literature for frequency of topics. NB A PDF of all responses can be made available on request, however is not available publicly as the ResearchGate social network is a member only group. Two short online discussions were referred to for data analysis, both instigated by the author. One discussion was instigated for this research project (Q1), the other was for another academic paper (Q2), which in small part looked at the technical ICT efficacy of teaching staff, and this was also considered relevant for this research. Q1 What are the key influencers that drive the increase of use(s) of technology in learning and teaching? Why are staff often so reluctant to use it? Q2 How skilled are academics in ICT? Does it vary across the disciplines?